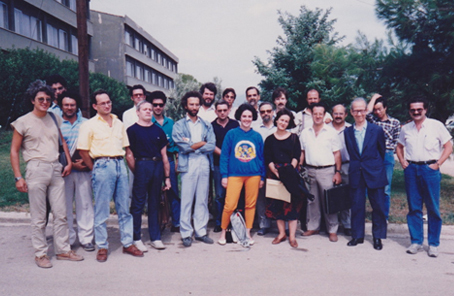 The origins of the NEB relativity conferences trace back to the 10th International Conference on General Relativity and Gravitation which was held in Padova, in July 1983. At that conference Petros Florides was surprised to see a significant number (~15) of Greek relativists attending, most of them presenting papers. Thus, on meeting (there, for the first time) Nikos Batakis and Dimitri Tsoubelis, he asked them if there existed some kind of national meeting of Greek Relativists ¹. As the answer was negative, he suggested that it would be a good idea to try to establish such a series of meetings, at different universities each time, where Greek relativists would get to know each other, talk about their work, establish collaborations, and so on. To this suggestion Tsoubelis responded that it will not work because “every one of us thinks he is a little Einstein”! Florides still remembers this exchange and the hearty laughter it produced, because it was unexpectedly funny and because it reminded him of a similar Irish anecdote, which he immediately recounted to his two new friends. The anecdote is about the common practice in Ireland that a newly appointed Papal Nuncio (an Ambassador of the Vatican) to the country would make courtesy calls to the 18 Irish Bishops to make their acquaintance. A month or two after some new Papal Nuncio arrived in Ireland he was asked whether he had met the 18 Irish Bishops. His answer, so the anecdote goes, was: “No, I haven’t met the 18 Irish Bishops, but I did meet 18 little Popes”! Despite the negative initial response, the seed was sown; and in further discussions with Basilis Xanthopoulos the idea grew and Tsoubelis withdrew his reservations. Soon after returning to Greece, Xanthopoulos and Batakis took the initiative to give it a try. So they appointed themselves “organizing committee”, applied for funding and invited all Greek relativists for a week-long (28 May - 1 June 1984) conference in Crete with the title "Recent Developments in Gravity" ("NEB" from the initials of the corresponding Greek words). About 20 participants ², both experienced researchers and doctoral students, showed up and almost all of them presented their work. They represented about 90% of all relativists working in Greece at the time. As the conference was scheduled to last a full 5 days, each lecturer had 1 1/2 hours! Presentations were very detailed, making them more like course lectures. Many presentations described "work-in-progress" rather than final results. The ample time allowed lengthy discussions in a relaxed atmosphere. Speakers were frequently interrupted and sometimes even ran out of time! The small number of participants, requiring everybody's presence at all lectures and enabling them to meet outside as a single group, contributed to a strong bonding between them. Naturally, they all agreed that the conference should be repeated in 2 years. And thus the biennial series of NEB conferences was established. The first 5-6 NEB conferences retained the characteristics of the first: small, week-long conferences, allowing plenty of time for each speaker. Apart from a couple of foreign students, all participants were Greek, whether working/studying in Greece or abroad, and the language was either English or Greek. Gradually, first by inviting foreign collaborators and some guest speakers, NEB conferences evolved into international ones, with most presentations in English. Recent conferences have become fully international: attendance has grown to 100+ participants, many having no ties to Greece and coming from as far away as Chile and Australia. As a result the NEB conference characteristics have changed: they now last 3 or 4-days, invited speakers have 50 minutes and contributing speakers 20-30 minutes, and parallel sessions have been introduced. Naturally, the feeling of camaraderie of the first conferences has been lost. The subject matter of the conferences has also changed. Originally it was strictly classical relativity, differential geometry, astrophysics and cosmology. Recently, however, an increasing number of contributions deal with quantum gravity, brane theory, or other non-standard gravity theories. There is a continuing debate among the members of HSRGC as to the direction the NEB conferences should take, as well as to who should be admitted to HSRGC membership. Old-timers agree, however, that the characteristics of the early NEBs, which made these conferences unique, cannot be restored. ¹Florides had in mind the “Mathematical Symposia” of the School of Theoretical Physics (STP) of the Dublin Institute for Advanced Studies (DIAS), which were organized by J. L. Synge in the 50's and 60's (and continue to this day). These symposia brought together established mathematicians and theoretical physicists, as well as research students in these subjects, from all universities in the Republic of Ireland and in Northern Ireland at a period when relations between the two countries were anything but friendly. As Florides recalls, “at these symposia the participants, young and old, met in a relaxed and friendly atmosphere to read a research paper or give a review lecture, hear and discuss each other’s work and establish friendships and research collaborations”. ²The registered participants of the first NEB were: N. Batakis, S. Bonanos, G. Contopoulos, P. Florides, K. Kalogirou, K. Kokkotas, K. Koutentakis, N. Panagiotides, T. Papakostas, P. Pappas, S. Persides, M. Saridakis, D. Sklavenites, N. Spyrou, P. Stavrinos, A. Stogiannidou, K. Tamvakis, M. Tsamparlis, B. Xanthopoulos.